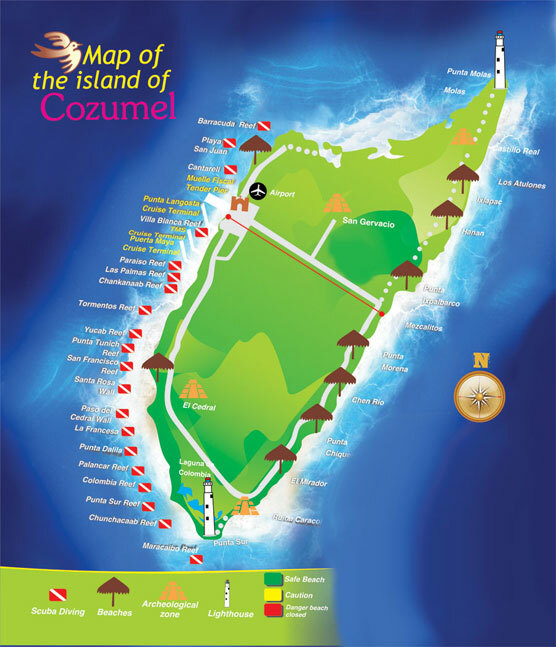 Map of the Island of Cozumel. Restaurants, Mayan Ruins, Beaches, Nightlife and more. Many divers like to take one day of their trip to off-gas and tour our beautiful island. The island is 32 miles long and 12 miles wide. Only the town (west) side of the island is settled. To the north and south of town are the hotel zones. 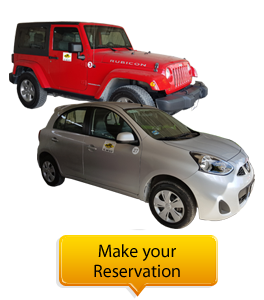 If you've never been around the island you can rent a car or a jeep and circle the island in half a day. There are many beaches and restaurants along the way, as well as some parks which charge an entry fee such as Chankanaab. There is also mini-golf, jungle tours, horseback riding, sailing and catamaran trips, and shopping. The Museum of Cozumel Island. A wonderful place to spend some time if you want to learn more about the island's history. There is a topographic map of the reef system, exhibits on the formation and natural history of the island, a photo gallery and a traditonal Mayan dwelling with demonstrations of daily life. There is a restaurant on the 2nd floor terrace for breakfast or lunch with a spectacular ocean view. San Gervasio - outside of town near the middle of the island are the San Gervasio Mayan Ruins. You may choose to tour the ruins yourself or hire a guide for a personalized tour. A self-guided tour brochure is available at the entrance. As you walk through the ruins you will find a tile plate at each point of interest that gives you an explanation of its significance in English, Spanish & Mayan. Trails follow the old Mayan road through the jungle which is alice with local wildlife such as birds, iguanas and butterflies. Best time to visit is in the morning when it is cooler. Bring a hat and water. The island is dotted with other small interesting remnants of Mayan culture. Chichen-Itza (off-island) The ruins of Chichen-Itza are only an hour from Cozumel by air or about 4 hours ferry / land . It can be done as a day trip or you can find accommodations nearby. Refreshments, souvenirs and guidebooks are available on-site. Chichen-Itza is the most famous of the ancient Mayan cities in Mexico and is very impressive. The earliest buildings Date to A.D. 600. Tulum (off-island) About one hour south of Playa del Carmen is the popular archealogical site called Tulum. The main structure is perched on a cliff overlooking the Caribbean sea. There is a picturesque sandy beach for swimming. There are about 60 stone structures at Tulum. It was part of a series of coastal forts established between A.D. 700 and A.D. 1000. and probably functioned as a trade center for the Maya. The site is well restored and as has visitor facilities. There are 2 different kinds of beaches on Cozumel. One type, on the west coast (the town / hotel side) offer stretches of white sand, usually calm waters, beach clubs and snorkeling. On the windward east coast (the "other side"), beautiful secluded beaches alternate with rocky ironshore along vast expanses of solitary coastline. The often roaring surf creates large breakers and sometimes treacherous undertows. There are thatched-roof ("palapa") beachside restaurants with cold drinks and fresh seafood. San Miguel's waterfront boulevard and the main plaza are the center of Cozumel's shopping. The town market located at Rosado Salas and 25th Ave. is an interesting and non-touristy place to shop with everything from meat, fish & produce to sandals and native clothing. Try the fresh-squeezed juices. Dining options in Cozumel range from simple to elegant fine dining. Seafood can be found everywhere. You will find traditional Mexican, Mayan, Italian, French, Lebanese, Chinese and American. For fast food junkies there are pizza shops, burger joints and even a McDonald's. If you have cooking facilities in your room or condo there are grocery stores with produce, meat, seafood, bakery and liquors. Evening entertainment begins and ends early in Cozumel, compared to the rest of Mexico. Discos, clubs and bars can be found downtown and in the hotel zones. A local fiesta takes place in the town square most every Sunday with a live Cuban or jazz band in the gazebo and dancing. Cozumel would not be Cozumel without Carnaval. Called Mardi Gras in some places, this huge party takes place every February, the week before Lent begins. The grand finale is on Fat Tuesday, the day before Ash Wednesday. There are parties, parades, costumes, live music and dancing in the streets. Everyone is invited, and everyone goes! Visitors, residents, babies, grandparents and even pets all go, dresses in beads, masks and of course dancing shoes! Well worth a February visit to Cozumel. Just a short ferry ride away, the cenotes of the Yucatan offer an interesting diving option for advanced divers. Cenotes are underwater caves and caverns that have been carved out of the limestone by the underground rivers that have navigated their way through the Yucatan over many years. The area if full of them and many have been charted and cleared for divers. Cave certification is not required to dive the caverns, but advanced diving skills are recommended. We can help to arrange your trip to visit them.